"The push and pull of a small Midwestern town is the driving force of this wistful novel about four childhood friends who are bound together, despite their desire to strike out on their own. Kip has left to earn his fortune in Chicago, Ronny to be a rodeo cowboy in Wyoming, Beth to find herself in Minneapolis, and Lee to New York to become a rock legend. Only Henry stays behind, taking over the family farm. But each character is called back to Little Wing, Wisconsin, some to confront destiny and others to tackle demons. 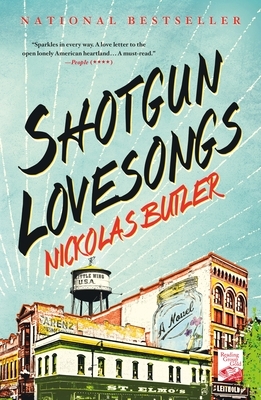 There’s a love triangle at the center of the story for sure, but at its heart, Shotgun Lovesongs is a gentle but still barroom friendly classic buddy novel." "I plowed through this book in one day, and I'm not a fast reader. It's not that it's a short book, although at 320 pages, it isn't exactly a doorstop either. And it's not that I couldn't put it down, I didn't read it in one sitting, but I kept coming back to it. What it is: unsparing, no-nonsense prose, redolent of the voices of Wisconsin; a study of the vicissitudes of friendship and love, betrayal and redemption, and the magnetic draw of home; a paean to the lives of the common (and not so common) folk of our state."